Great game to watch, best home game of the year! Video Blog: Why did my house not sell? First video blog. Hope you like it! On June 11, the Government of Ontario passed the 2013 provincial budget. Included in the budget is OREA’s proposal to amend the Electronic Commerce Act (ECA), 2000. Once proclaimed, this amendment will give REALTORS® and consumers the confidence to use modern technology that will make transactions more efficient and accessible. Follow the link for OREA’s press release. Getting the amendment into the budget is a significant accomplishment for OREA and REALTORS®. Every year dozens of organizations lobby the government during pre-budget consultations. This year OREA was one of a very select group of organizations who were successful in their efforts. OREA’s success on electronic signatures speaks to the strong advocacy campaign the association has coordinated over the past year with the help of hard working volunteers from the real estate boards across Ontario. Of note, the government has included a section along with the amendment that says it will come into force upon proclamation. As a result, electronic agreements of purchase and sale will not benefit from the legal protections of the ECA just yet. This section is meant to give the government time to talk with various stakeholders, including OREA, about any security measures that might be useful to put in place in anticipation of its coming into force. OREA staff will be working with the government in the coming months to get this important amendment proclaimed into law. Inspiration for the amendment comes from a private member’s bill introduced jointly by Prince Edward-Hastings MPP Todd Smith and Ottawa Centre MPP Yasir Naqvi (now Minister of Labour) in May 2012. OREA thanks Minister Naqvi, MPP Smith and Attorney General John Gerretsen for championing this issue on behalf of REALTORS® and consumers. OREA would also like to thank Minister Sousa and Premier Wynne for including this important amendment in the 2013 Ontario Budget. After passing the budget the legislature adjourned for the summer until September 9.
and affordability continues to bolster demand in the area. this year was recorded at Mississauga Lake for $1.6 million. The appeal?—clear water, good fishing and greater privacy. the East Kawarthas on track to finish the year above 2012 levels. Summer has finally arrived and its impact is evident on recreational property markets across the country. Greater stability is returning to this segment after several years of slow growth, with close to 70 per cent of markets expected to match or exceed 2012 sales by year-end. With buyer enthusiasm climbing, many markets have experienced a rebound in activity in recent months. 1. Confidence is growing in overall economic performance. 2. Selection of recreational product is at its best level in recent years. 3. Prices have softened in many Canadian markets. 4. Paper wealth accumulated in the stock market in recent years is making its way into recreational property markets. 5. Purchasers are bypassing tighter financing criteria through HELOCs (Home Equity Line of Credit) on their principle residence. 6. Increased foreign and out-of-province investment. Signs of change have emerged in recreational hotspots nationwide. Deals are coming together with greater ease, with more buyers and sellers reported to be on the same page. 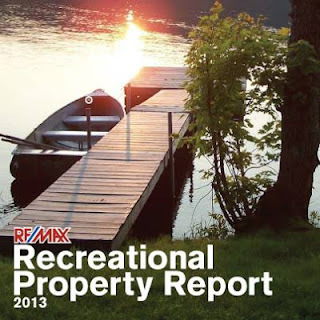 Multiple offers have been noted in some Muskoka markets. Luxury sales have experienced an uptick in a number of recreational communities in Ontario, including Prince Edward County, Collingwood, Honey Harbour, Grand Bend, Haliburton, and Innisfil to Oro. Given the steady momentum of today’s market, there are indications that 2013 could emerge as the turning point—suggesting the window of greatest opportunity is likely drawing to a close. Baby boomers continue to fuel the lion’s share of demand, securing properties for family enjoyment and/or with an eye to retirement down the road. More mature boomers are opting for existing and proposed residential development on the waterfront, offering all the comforts of home, but none of the upkeep. Ontario’s Huntsville and Midland/Penetang/Tiny/Tay are prime examples. Full-time living is on the upswing, and as a result, this demographic is fuelling the growing trend toward renovation. Teardown activity has subsided in many markets as fewer ‘traditional cottages’ are listed for sale. The rising cost of construction—and added HST—has also served to increase the appeal of resale recreational cottages, second homes and chalets. There are some exceptions, as new builds continue unabated in some Ontario markets including Grand Bend, Bala/Port Carling, Midland, Innisfil to Oro, and throughout Eastern Ontario, as well as in Shediac Bay, New Brunswick and the Newfoundland Coast (East). Value continues to be a key driver, with momentum strongest at the entry-level price points—between $250,000 and $500,000. With starting prices down or unchanged in 77 per cent (24/31) of markets examined in 2013, a great deal of opportunity exists for those ready to secure a recreational getaway. Regardless of the type of product or price point, it’s clear that favourable conditions and confidence have bolstered interest and intentions this year. The stage is set for a solid 2013 performance. Flaherty says "the uncertainty ends today"
We are being told the Pickering Airport is a go. Finance Minister said on Tuesday the 7500 hectares that was taken from Pickering residents four decades ago will finally proceed to become an airport. Additional land will also be set aside for economic development, and Flaherty says Ottawa will consult with community and business groups to figure out what to build. I hope that this is the case. I personally have mixed emotions on this development. I think the economic impact for Peterborough will be huge. However, the environmental cost to wildlife, farm lands and wetlands must be considered as well. This all said, the government has made the decision and work will start immediately. According to Flaherty it will take 10 years to construct the lower quadrant of lands for the airport. 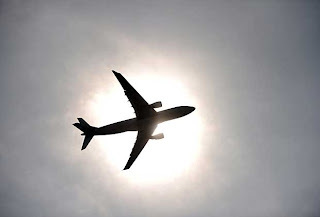 No cost has yet been assigned to the construction of the airport. Thank you still in order for GE but also a thank you to the community of Peterborough and the Fisher Family for fountain. After reading the article in the Examiner about GE giving the Centennial Fountain to Peterborough in 1967, it turns out there is more to the story. According to the Peterborough Examiner it was Frank Fisher who came up with the idea of the fountain, with Bill Fisher leading the design committee and Ches Fisher leading the fundraising committee. The cost of the original fountain in 1967 was around $30,000. Current management at GE was under the impression GE donated the fountain but can not find anyone or any documentation saying so. That said GE is still pleased that they are in a position to fund the current refurbishment. General Electric steps up for Peterborough again. Centennial Fountain in Little Lake needs to be repaired. The cost to repair to Peterborough was estimated at $90,000. 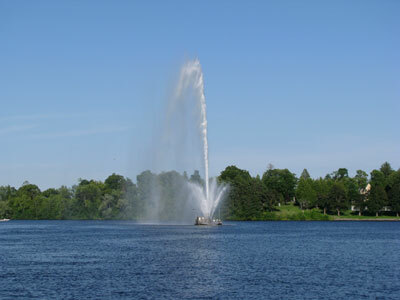 That money was already approved by council to spend on the fountain but last night according to the Peterborough Examiner (Brendan Wedley), GE made the commitment to pay for the repairs. The fountain was actually a gift to the city from GE in 1967. At that time the gift was a significant contribution to the city and the covering the cost of repairs is just as significant. Thank you GE.